How does the new OnePlus flagship shape up against its predecessor? The OnePlus 3 is official, and it's fantastic - with a premium design, a whole heap of power and a still attractively low price tag. But how does it compare to its predecessor, the OnePlus 2, which the Chinese firm lauded as the '2016 Flagship Killer' when it launched? We've put the two handsets head to head to bring you all the answers. When it comes to design, there is a big, big difference between the two phones. The OnePlus 2 features a mainly plastic construction with a questionable sandpaper textured rear which provides plenty of grip, but little in the way of premium appeal. There is a metal frame running round the circumference, which solidifies the handset and gives a premium look from the front, but in the hand you're well aware this is a cheaper device. Things are very different with the OnePlus 3. The Chinese firm has taken a single block of aluminum to forge its latest flagship handset, giving it a supremely professional finish. The brushed metal rear gently curves to hug your palm, the antenna bands are reminiscent of the HTC One M9 and the square camera bulge is very Samsung Galaxy S6. It may not have broken any new ground with design, but the OnePlus 3 can proudly stand shoulder to shoulder with the iPhone 6S, Samsung Galaxy S7 and HTC 10. At first glance you'd been forgiven for thinking nothing has changed. Both the OnePlus 3 and the OnePlus 2 have 5.5-inch, full HD displays. That's the same 401ppi pixel density then, but where the OnePlus 2 is protected by Gorilla Glass 3, the OnePlus 3 has the tougher Gorilla Glass 4 slapped on top. OnePlus hasn't taken the leap to a QHD resolution for its third-generation handset, even though rivals including the Galaxy S7, HTC 10 and LG G5 all have, but it has made improvements over its predecessor. While the OnePlus 2 uses an LCD panel, the OnePlus 3 boasts an AMOLED screen, giving you brighter, bolder colors. The difference is noticeable, and it makes everything look better. OnePlus has gone as far as to tweak the display in-house, creating what it calls Optic AMOLED, which in short means deeper blacks and more vibrant reds for what it believes is an enhanced viewing experience. It looks good, but this tinkering isn't immediately obvious. One of the cornerstones of the OnePlus 'Never Settle' philosophy is packing top-notch power into its handsets. The OnePlus 2 comes with a Snapdragon 810 processor and 3GB or 4GB of RAM – depending on whether you opt for 16GB or 64GB of internal storage. In 2015 that was a stellar line-up, but the 810 chip had a few gremlins which gave some users a poorer experience. The OnePlus 3 kicks improves on this with the new Snapdragon 820 processor and a market-leading 6GB of RAM. That's a whole lot of power, and while you're unlikely to need that much RAM currently, it leaves the door open for app developers to push their creativity even further. Looking at the Geekbench results, the OnePlus 3 clearly outperforms the OnePlus 2 with an average multi-core score of 5425 compared to 4795 from its predecessor. The OnePlus 2 launched with Android 5.1.1 Lollipop, with the firm's own Oxygen OS interface running on top. Oxygen is a fairly light Android skin, keeping the look and feel of Google's operating system while adding in handy extra features. Since its launch, the OnePlus 2 has been upgraded to Android 6.0.1 Marshmallow, with the latest version of Oxygen on top. That latest update brings the OnePlus 2 in line with the software offering on the OnePlus 3. On screen there's nothing to separate the two handsets, but with its additional power and AMOLED display the OnePlus 3 delivers a slicker, brighter, more colorful Android experience. Pick up the OnePlus 2 and you'll get a 13MP rear camera with laser autofocus and OIS (optical image stabilization). It's a serviceable camera, but it couldn't compete with the best of the 2015 flagships, let alone get close to the quality of the 2016 bunch. Round the front a 5MP snapper gives you access to some solid selfies and 720p video recording. The OnePlus 3 trumps this with a 16MP rear camera boasting phase detection autofocus, auto HDR, HD mode and RAW support. It's a clear improvement over the OnePlus 2, but it's still outperformed by the likes of the Galaxy S7. On the front an 8MP selfie camera features smile detection, allowing you to flash a grin at the phone to start a three second countdown time – no more fumbling around with buttons! Things get a little more interesting as we move onto battery. The OnePlus 2 was given a bigger, 3,300mAh battery over the original OnePlus One (3,100mAh), but things have taken a step back with the OnePlus 3. The firm's latest flagship phone comes with a 3,000mAh battery, as OnePlus slims down the metal body to a svelte 7.3mm leaving less space for a power pack and everything else. With its slightly smaller battery the OnePlus 3 just about sees out a full day with moderate usage, but it's the OnePlus 2 which manages the feat a little more easily. Running the TechRadar 90-minute video test with brightness at maximum and accounts syncing via Wi-Fi the OnePlus 2 lost 27% of juice, while the OnePlus 3 dropped by 23% which shows an improvement in power consumption on the new handset – if only the battery was just that bit bigger. The OnePlus 3 does support the firm's new Dash Charge technology, which can refuel your phone by 60% in just 30 minutes, perfect for a quick blast before a night out. The OnePlus 2 was originally available in 16GB and 64GB variants, but now you can only get it in the larger storage size. Space has always been a limiting factor with OnePlus handsets, with the Chinese startup opting to steer clear of expandable storage options – which means there's no microSD slot on the OnePlus 2. It's a similar story with the OnePlus 3, which again doesn't feature a microSD slot. OnePlus has also paired down its storage options, with a 64GB model the only one available. Both handsets feature front-mounted fingerprint scanners below their screens, with the capacitive touch pads doubling as home buttons. The scanner of the OnePlus 2 was the firm's first, and it had some teething issues early on with unreliable finger recognition and slow unlock speeds. Further software updates have improved performance, but it's never been solid. Things are much improved on the OnePlus 3 though, with unlocking occurring in just 0.2 seconds – faster than Apple's Touch ID – and recognition second to none. When the OnePlus 2 went on sale in August 2015 it wasn't all that easy to get hold of. You needed to get an invite to buy, and even then delivery for some customers took rather a long time. 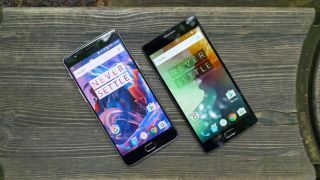 Thankfully OnePlus has ditched the invite system, which it also used for the OnePlus One and OnePlus X, and you can now hop online and pick up the 64GB OnePlus 2 for £249 (US$299, around AU$350). The OnePlus 3 is the first phone from the Chinese company to launch without the invite system, allowing anyone to purchase it right away for £309 (US$399, around AU$450), which is slightly more than its predecessor's launch price. It's no surprise the OnePlus 3 is the better of the two smartphones here. It's got a great design, plenty of power and a big enough feature set to make it a genuine flagship contending – but it won't cost you anywhere near as much. The OnePlus 2 is still a decent buy at its new, lower price, but if you can afford the extra £60 (US$100) the OnePlus 3 is well worth it.